Currency that a government has made legal tender, even though it is not backed by reserves and therefore relies on trust alone. Officially since 1971, all national currencies operate as a pure ‘fiat’ system or a system where money is created out of nothing (‘ex nihilo’) through simple bookkeeping entries. This fiat currency paradigm is succinctly summarised by James Galbraith: “When government spends or lends, it does so by adding numbers to private bank accounts. When it taxes, it marks those same accounts down. When it borrows, it shifts funds from a demand deposit (called a reserve account) to savings (called a securities account). And that for practical purposes is all there is.” In other words, sovereign governments are not like any household, as claimed in the Official Paradigm. “The government taxes us and takes away our money for one reason – so we have that much less to spend, which makes the currency that much more scarce and valuable. Taking away our money can also be thought of as leaving room for the government to spend without causing inflation.”  This does not mean that there are no consequences when a sovereign government overspends by over-using these accounting entries. Such consequences take the form of inflation and/or reduction in value of the currency on the international markets. What is the role of the banking system in all this? Simply put, they administer the giant accounting system that keeps track of money flow. They are also in the business of creating bank-debt money with the expectation of making a profit. By ‘making loans’, banks buy IOUs from borrowers in exchange for providing them with a credit in fiat money. In principle, banks can make loans only to the extent they have sufficient reserves. In practice, however, “banks do not wait for excess reserves before making loans and creating deposits. Rather, if faced with a credit-worthy customer and a request for a loan, a bank makes the loan. It then operates to obtain reserves as necessary to meet legal requirements. If banks in the aggregate are short of required reserves, the central bank automatically must supply them. In spite of rhetoric about Fed policy to discourage such borrowing it is simply impossible for the Fed to refuse to supply the reserves needed by the system.” It is even harder for a central bank to get banks to make more loans if they are not inclined to do so. When central banks try to push banks to lend, as was the case after the crash of 2007-2008, it is like trying to “push on a string”. All four major central banks of the rich world – those of the USA, Britain and Japan and the European Central Bank – have their lending rate near zero. Japan’s has basically been stuck there since the 1990s, without succeeding in a relaunch of its economy. So, contrary to what is often claimed, the degree of control central banks exert over the creation of bank-debt money is more theoretical than practical. Central banks are reduced to the role of pricing the marginal cost of reserve funds for the banking system. They determine only the cost of getting additional reserves from the central bank, a cost that banks pass on to their clients with an additional mark up. They do not determine the amount or timing of bank-debt money being created by the banks. The development of the massive interbank market has further reduced the need for banks to go to the central bank’s discount window. This has further marginalised the influence of the central banks. Central banks thus have more limited control over the banking system’s money creation process than is generally believed. They also seem to have difficulty grasping the notion that in a floating-exchange world, when a country such as the USA pumps trillions of additional dollars into its economy, the inflation that is being created may manifest on the other side of the world. For instance, these additional dollars could end up being spent by wealthy Russians on real-estate on the French Riviera, regardless of what the French or European Central Bank may want to do about it. In contrast, governments are not as powerless as they seem, at least in theory. Governments are needed continuously for giving value to any fiat-created currency. However, based on their actions, governments are not making use of the power they have over the private banking system. Whether this is because they are unaware of having such power remains unclear. When governments require payment of taxes in a specific medium of exchange, they automatically increase its scarcity. As a result, that medium acquires more value. A sovereign government can therefore choose the instruments of payment it wants to give value to. In so doing, it can determine the kind of effort its citizens must make or the types of behaviour they must engage in to obtain these instruments. This conclusion will be critically important for the design of government-initiated monetary solutions. There is still one last veil to be lifted in the monetary domain. The financial system exerts power over governments by influencing beliefs. As George Soros pointed out with his reflexivity theory, the difference between finance and classic physics is that belief creates reality. It is a world of self-fulfilling prophecies. In physics, an apple will fall to the ground whether people believe in gravity or not. In finance, if enough people believe gold will defy gravity and double in price, the price of gold will actually double! Although the belief may not be solid enough to keep the gold price at that level when real-life supply and demand manifest, a big price movement will have occurred in the interim. Similarly, if enough people believe a particular government will default on its debt, investors will divest themselves of enough bonds to create substantial real pressures on that government. These pressures can even directly provoke the default. 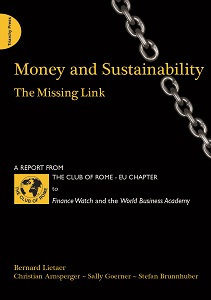 Extracted from Money and Sustainability: The Missing Link, Bernard Lietaer et al. James Galbraith in the Preface to Mosler (2010), p.2. This is the usual way of explaining the process by which bank-debt money gets created, which is the one we used initially in Appendix A to explain the process. In practice, the reserve limit is basically not binding. If a bank is short on reserves, this ‘short’ is in fact an overdraft on its reserve account with the central bank. This overdraft is effectively a loan from the central bank. So there is no way that a central bank could deny credit to a bank. This is one of the reasons why central banks are even more worried about deflation than about inflation. To reduce inflationary pressures, they can make loans more expensive by increasing interest rates. But when central banks are facing deflation, interest rates can only go as low as zero to convince people to borrow (although the Bank of Japan has even gone as far as charging a negative interest rates to the banks to stop deflation, without much success). Central banks policies in January 2012 have been compared to “crazy aunts on the loose” in their desperate attempts to use Quantitative Easing, a tool that “is best kept in a locker marked 'for Emergency Use Only' is how Charlie Bean, the Bank of England's deputy governor, put it in 2010”. The Economist 7 January 2012 p.58. George Soros, The Alchemy of Finance (1987). 1) Use the Idioticon index. 2) Use our Pearltree (graphic view).